94 Henschke Hill of Grace. When your time is short, you go straight to the head of the head class. Or at least I did..
What’s interesting about this is how much sediment it dropped and just how brick red it was. Certainly rather advanced in the scheme of things, and only ‘just legal’ (as wine woman Danielle Kennedy succinctly put it). That didn’t stop it looking particularly tasty though. A drought year wine and given all French oak because of it (the Henschke’s usually prefer a combination of French and American for HoG). 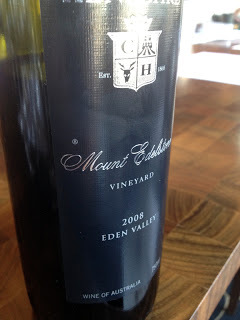 I don’t expect many to agree with me perhaps, but I find this to be a more enjoyable wine than the 2007 Hill of Grace. What’s more I’ve tried this wine twice now and enjoyed it both times (so it’s consistent too). 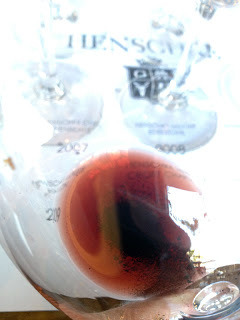 Again it’s probably a slightly more forward Mt Ed, but I’d still recommend for Henschke lover. From what I can gather this sits at the ‘Reserve’ level of quality in the Stonier portfolio and is drawn from a single vineyard. Circa $45 retail. Like the Reserve it’s a heavily worked style in the ripe and rich, Paringa-esque mode of big and buxom Mornington Chardonnay (which I have an occasional soft spot for). Do you know what the most interesting thing about this wine is? Just how much it shares – in style, flavour and form, with the 09 Dog Point Pinot I had last night. High praise for the Dog Point perhaps but also indicative of how the warm vintage has styled wines like this. 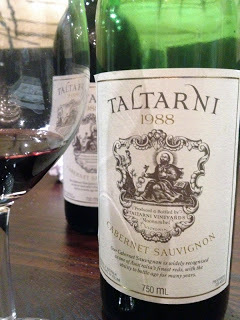 I banged on at length last year about these old Taltarni Cabernets and this may be an even better wine than the 87 I enjoyed so much. Simply put if you like old Australian Cabernets, nay, just Cabernet in general, you need to get onto this. Available from the winery if you ask very very nicely apparently (a little bit in retail too. Sells for circa $95 per bottle). A promising new addition to the Innocent Bystander range, though interestingly priced and positioned at Giant Steps level (or more) at $59ish. 100% whole bunch, small batch and gravity filtered. What I’m intrigued about is that it’s so polished and silken. Yes it carries the undergrowthy, heavily (black) peppered sort of ham and vegemite whole bunch influence but it’s also surprisingly slippery and even just a fraction too juicy and bright, finishing super clean and ‘I can’t believe it’s not filtered’ bright. Actually, it’s a very model of a modern Yarra Shiraz (I’m calling it Shiraz as I can’t see this as Syrah).